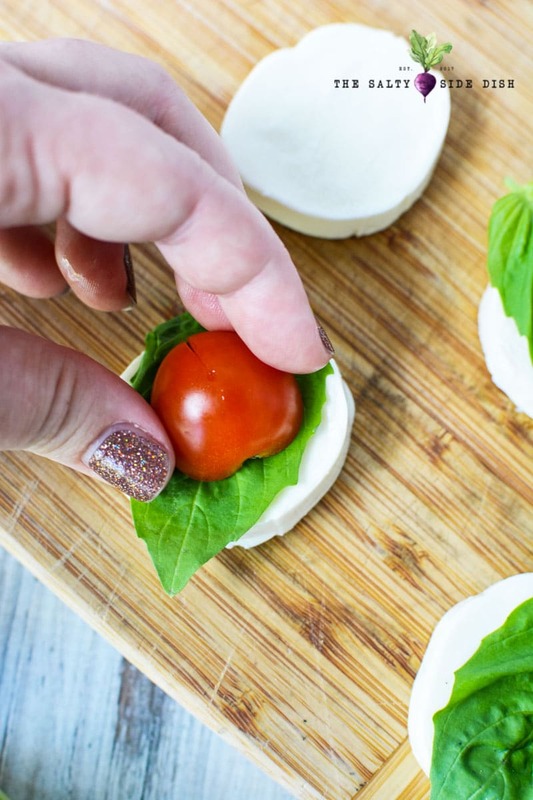 Caprese Appetizers are a fun way to serve up everyone’s favorite (tomatoes and mozzarella) in individual bite sized deliciousness. SO easy to make and done in minutes, you can dip your Caprese salad bites in mini containers of balsamic and create the most adorable food tray. Try Cherry Tomato Balsamic Salad and a traditional Caprese Salad to round out the yum. 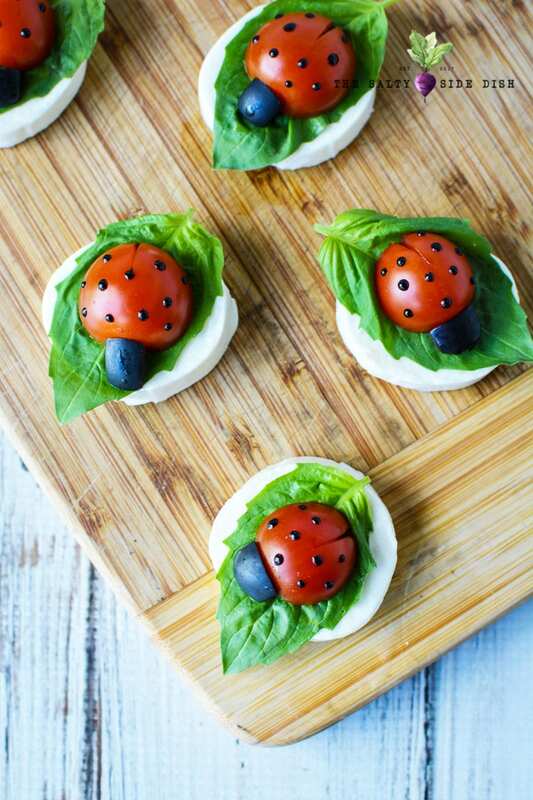 You will love how adorable and how easy these Caprese bites are to make. Nothing to bake, nothing to cook, serve up as a side dish or perfect for an appetizer platter all year long. While I used cherry tomatoes, you can also use grape tomatoes or even the colorful tomatoes like in this tomato salad. Full disclosure, there’s not balsamic in this. But you can put a very small amount under the tomato or under the basil if you wanted to. You could also just supply some to dip into. These condiment containers would work well for a large group. Here is my balsamic vinegar reduction recipe. These ladybug appetizers aren’t hard to make, so do not let the cuteness of the animal food throw you off. Looking for sliced cheese? I used BelGioioso and it’s a pre-sliced Mozzarella. You get 14 full slices, not counting the 2 ends, so enough to make a full tray! 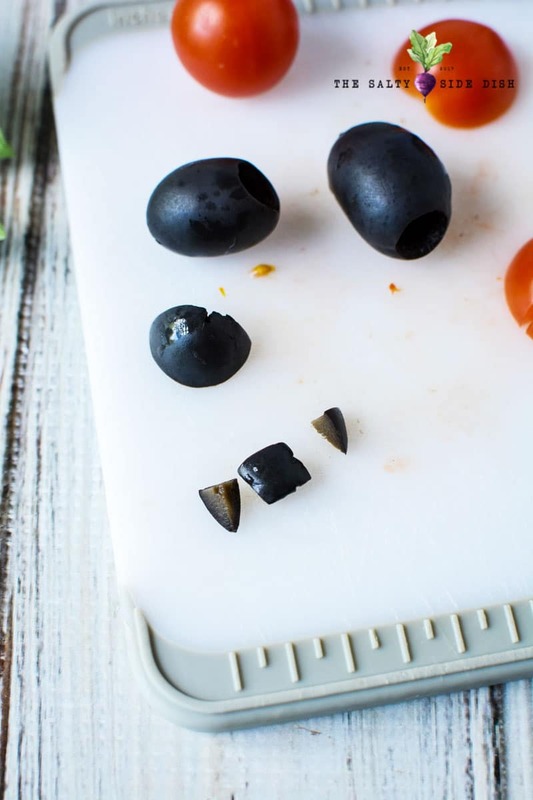 I used jumbo black olives and probably should have purchased medium sized black olives. This might mean you can make less cuts on the head. Need more appetizers? When serving a large crowd you never know who you are going to get. Prepping dips, salsas, and finger foods of a large variety can be overwhelming, so here are my favorites. Neiman Marcus Dip – just like grandma used to make, its a million dollar dip to dip into! 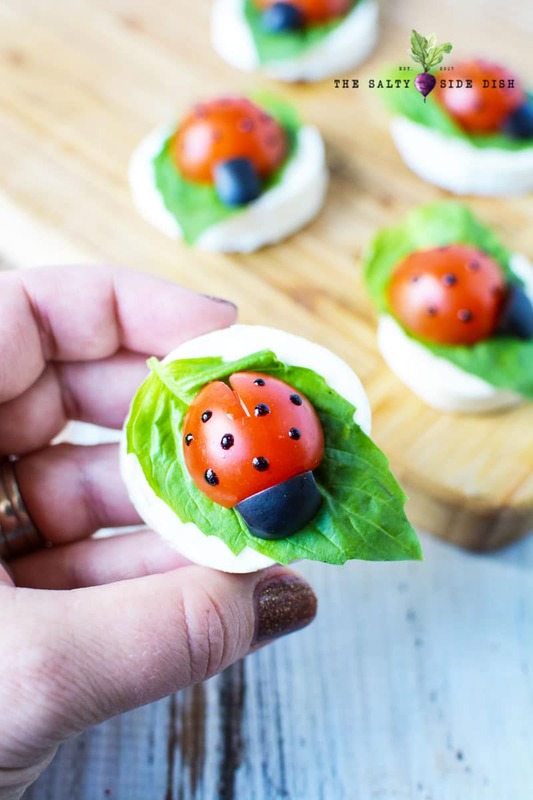 These mini lady bug appetizer bites are a perfect way to enjoy a salad in a perfectly portioned way! Place cheese rounds onto a serving tray or platter. Place 1 basil leaf on each cheese round. You can usually grab basil leaves right from the produce section of your store but they are also SO SIMPLE to grow! 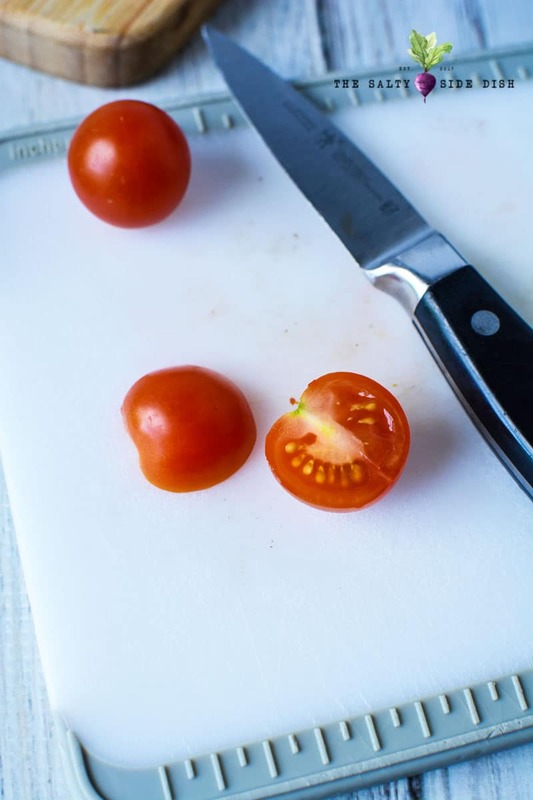 Halve tomatoes and cut a small slit into the center to create wings. Place the tomato half onto the basil leaf. Slice away 1 end of the olive and slice that small piece in half. Cut the ends of each half to create a head. Place head onto the tomato. 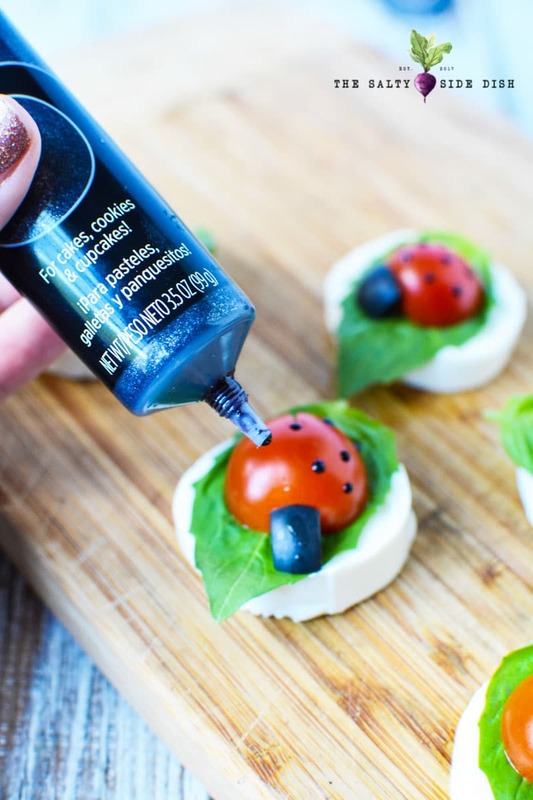 Use color gel to create spots on the lady bug. Die from Cuteness of the food animal. Caprese Salad Appetizers are a fun way to serve up everyone's favorite (tomatoes and mozzarella) in individual bite sized deliciousness. 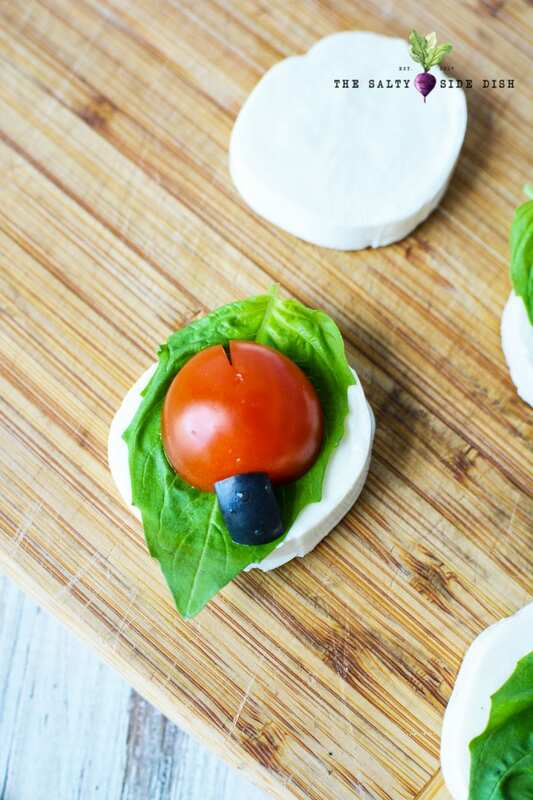 SO easy to make and done in minutes, you can dip your Caprese salad bites in mini containers of balsamic and create the most adorable food tray. Place cheese rounds onto a serving tray or platter. 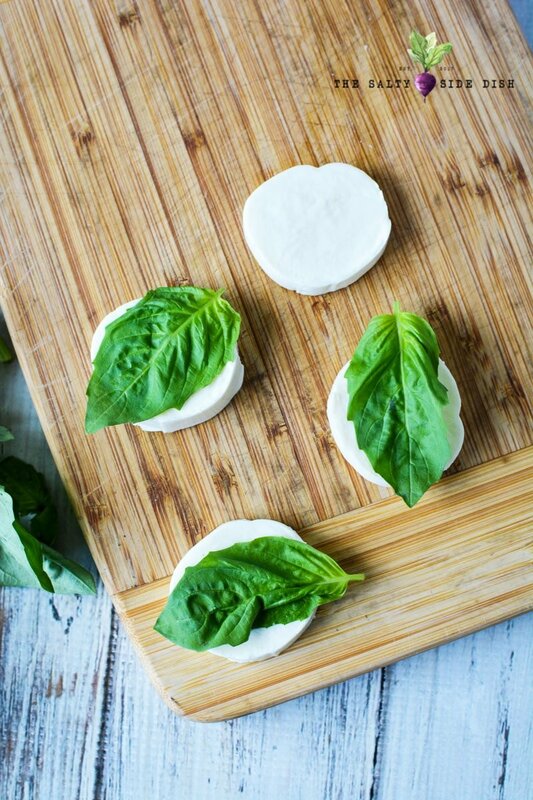 Place 1 basil leaf on each cheese round. 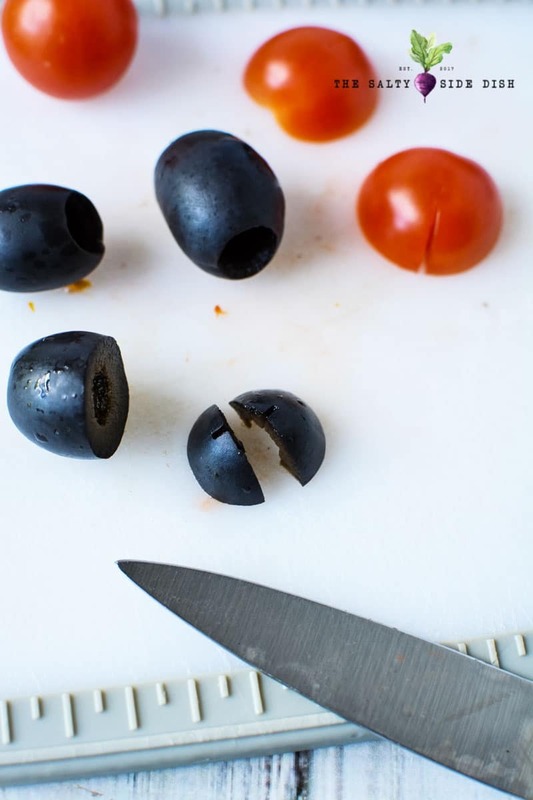 Halve tomatoes and cut a small slit into the center to create wings. Place the tomato half onto the basil leaf. Slice away 1 end of the olive and slice that small piece in half. Cut the ends of each half to create a head. 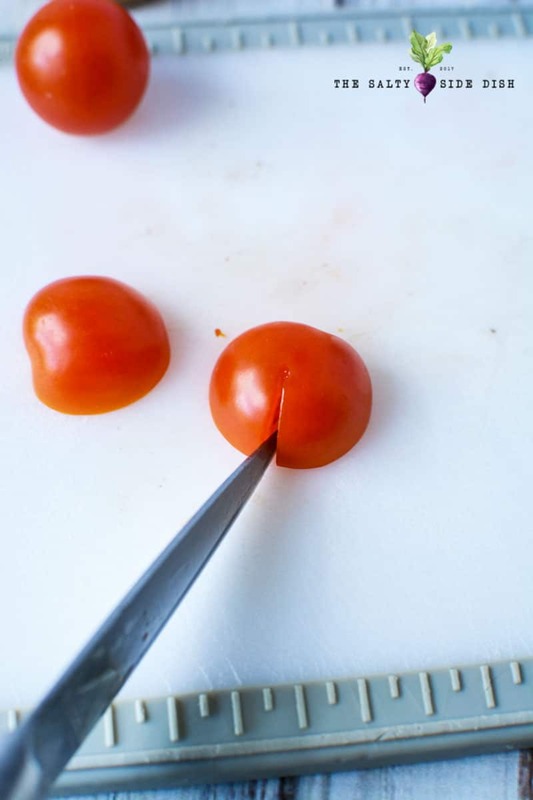 Place head onto the tomato. These are so cute! I’m going to make them, but week use dots of basalmic vinegar reduction for the spots. Thank you so much for this idea! Let me know how they turn out w/ the balsamic!